Home Companies Anping Fang Da Metal Wire Mesh Products Co., Ltd. Expanded metal mesh can be used for security guarding and fences with its features of uniform structure, economic cost and great strength. Light type expanded metal is used in common fencing while heavy type expanded metal is used for security guarding. Expanded metal mesh for common fences is diamond opening mesh. This kind of metal fence is popularly used in gardens, schools, general fencing for living area and industrial sites. SWD: 2.5mm-50mm (Short Way of the Diamond), the distance from the middle of the bond on one side to the middle of the bond on the opposite side. LWD: 3mm-100mm(Long Way of the Diamond) is the distance across the largest dimension of the diamond measured halfway between the diamonds. Thickness(gauge): Up to 8mm, Original thickness of metal before expanding. Strand Width: 0.3mm to 8mm, Amount of metal between diamonds to produce one strand. Diamond, square hole, scale hole. The surface include electric galvanized, hot galvanized or pvc coated. Aluminum plate, low carbon steel plate, stainless steel plate, aluminum alloy plate, copper plate and nickel plate. 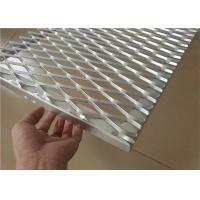 Expanded metal from aluminum plate, expanded steel plate and stainless steel plate. Opening shape: diamond, square, round, triangle and scale-like opening. Diamond expanded metal offers traditional decorative effects. Good visual effects and many choices of colors and materials. Easy operation, long work life, enduring, graceful. Be broadly used in the areas such as highway, railway, residence, irrigation works and the protection partition of machines, electrical appliances, windows and aquiculture.